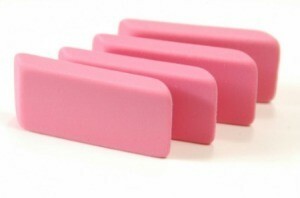 Pencil erasers have a secret life away from the pencil and many alternative uses. This is a guide about uses for pencil erasers. 1. Gently clean gold jewelry with an eraser. 2. Remove marks from your piano keys with an eraser. 3. Use an eraser to clean cotton upholstery, rub lightly. 4. Clean scuff marks on kitchen and bathroom floors with an eraser. 5. Prevent framed pictures from tilting on your wall by gluing small pieces of eraser to the bottom corners of the frame. Make sure you glue them to the back where the frame makes contact with the wall. Wedge shaped pencil erasers (pencil toppers) make good replacements for lost glue bottle caps. The round hole fits many of the "squirt" type bottle tips, while the wedge end will go into the slotted type end that comes on many wood glues.